Planning and decorating your special day doesn’t have to be stressful. We’ve put together a few tips as a guide to get you started organizing the décor for your special day. Your entrance can be marked by a simple gate, beautiful ribbons, or even flowers in big vases. A decorated aisle can you make your wedding march even grander. Scattered flower petals, a red runner, greenery, and lanterns are simple ways to spruce up the aisle, while still keeping the focus on the bride. 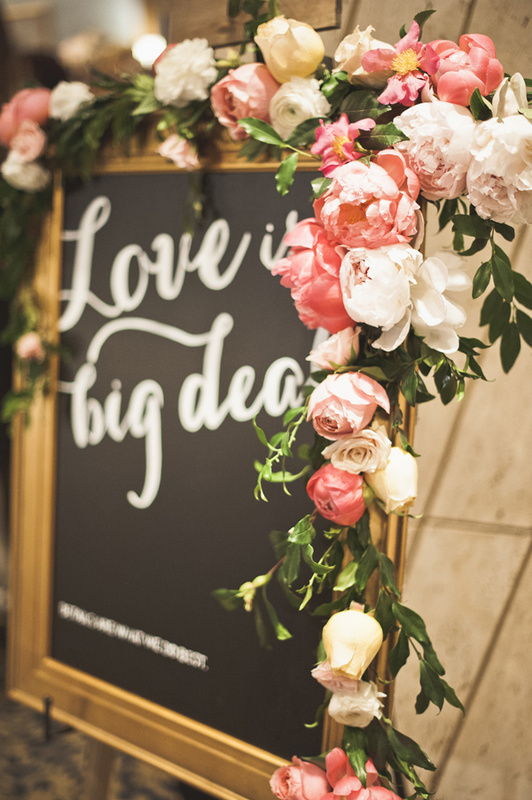 Big and small weddings need direction, and handmade signs can be a unique and creative way to personalize your wedding. Custom make ceremony or reception signs from chalkboards or wooden posts and include quotes, photographs, and other sentiments to add a wow factor to the festivities. Banners are an effective way to set the tone during a reception. They can announce your new name, provide direction or tie into your colour scheme. Wedding flowers typically go along with the planned colour scheme. The classic bride’s bouquet is the most common floral accessory, but flower filled centerpieces a floral backdrop, floral fountain, topiary, staircase display or floral chandeliers are just a few of the ways flowers can enhance your decor. When planning your stage and lighting, it is important to consider what will look best at your venue such as the banqueting halls in London. Indoor and outdoor weddings have different lighting requirements, but both can set the tone of the atmosphere to ensure your guests are relaxed and having a great time. The stage is the centerpiece of your wedding and is a reflection of the couple. Whether it is set in a rustic theme, all floral or edgy and geometric all eyes will be on the happy couple. Centerpieces are placed in the middle of the reception tables and decorate your venue’s space with the colours of your wedding palette. While floral centerpieces are the most common think beyond flowers and consider candle bunches, greenery and fruits and vegetables. For couples who choose to have a seating chart, there are some etiquette rules as well as considering the shape of your tables and your floor plan. Assigned seats can help to keep your head count correct and the servers happy! Wedding cake toppers are a personal and unique feature placed on top of the cake. Traditional toppers are bride and groom figurines, but first names, a meaningful quote, paper dolls, silhouettes, puzzle pieces, and love birds are all great options. Take your wedding photos up a notch by adding a vintage theme, wedding arch or another prop for a fun and sentimental memento of your day. Decorate wooden swings, a statement chair, a backdrop or add personalized messages on mini chalkboards, and let your personalities shine through. There are many stylish and creative ways to incorporate your personalities into your wedding and reception decorations, but still, keep the spotlight on the newly married couple. With over 30 years of experience, Premier Banqueting London is a well-known company for hosting all types of events such as Weddings, Receptions, Exhibitions, Corporate Events, Charity functions and Private Parties. Get in touch with the team today. “Something Blue” = Your Flowers! We’ve all heard the old saying about what a bride is supposed to do to have good luck on her wedding day (and in her subsequent marriage) and one of the key components is having “something blue.” Brides opt for a variety of blue items but should not overlook an obvious and necessary component of their special day: their wedding flowers! Blue is one of the most popular colors for any event. Incorporating blue flowers is more unique and blue flowers are perfectly suited to many wedding themes, from formal and elegant cocktail receptions, to nautical and beach themes, to farm and country shindigs. Opt for beautiful “true blue” flowers in your bridal bouquets and ensure added luck for your whole event! 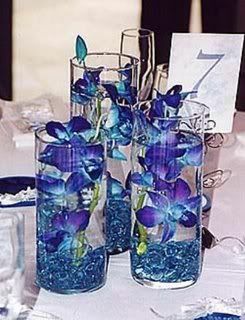 Read on for some inspiring ideas on how to incorporate beautiful blue flowers into your wedding day. A stunning blue bridal bouquet is the perfect choice for your “something blue!” These beautiful Heavenly Mist bouquets are full of vivid blue flowers including blue freesias and blue nigella flowers. There are bridesmaids bouquets to match and all of them will be the talk of the wedding. 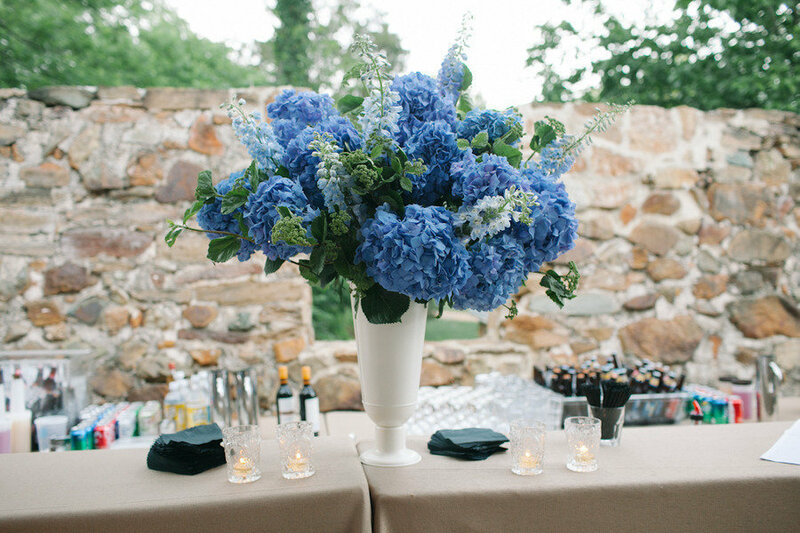 Choose stunning blue hydrangeas and you will have something more unique and memorable for you venue, especially if you have crisp white table linens. Best of all, blue pairs well with virtually any color so it’s always a fabulous choice for a wedding palette. 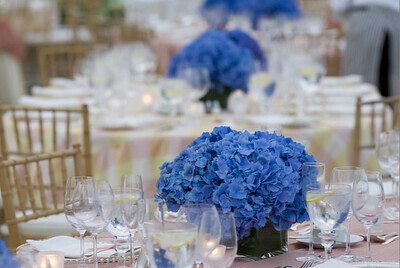 Order bulk blue hydrangeas for some simple DIY centerpieces. You can also order pre-made blue hydrangea centerpieces that are ready to go in your own vases and get them shipped right to your home before the big day. Gorgeous blue delphinium and blue iris are other wonderful blue flower choices. Pair them with white flowers for a fresh and elegant centerpiece that is suitable for any occasion from casual to formal. Shown here: Midsummer Night’s Dream. Blue also pairs very well with fresh green! In this Blue Sky bouquet, soft blue hydrangeas combine with elegant green orchids for a truly special presentation. If you want a blue flower that is especially exotic and unqiue, opt for some amazing “Born Blue” blue dendrobium orchids! If you buy in bulk these gorgeous blooms are surprisingly affordable! These beautiful submerged centerpieces are surprisingly easy to DIY! Order your bulk orchids and check out this helpful DIY video for how to make them yourself! Using your flowers as your “something blue” is sure to bring you joy and luck on your special day! If you are looking for ideas on how to dress up your wedding or event, you may want to take a look at flower garlands. These versatile and beautiful decorating elements add a powerful visual punch to…well, just about anywhere you want to create drama, beauty and draw focus. Flower garlands can be any size or length and can incorporate many kinds of lfowers and greens. Some poplar flower choices for garlands are roses, carnations, peonies, gerbera daisies, or lisianthus but the choice is yours. Popular greens could include ivy, seeded eucalyptus, lemon leaves, or pittosporum. Order in bulk from a reputable online flower vendor and save big. Garlands are relatively easy to DIY if you have modest craft skills. Order floral supplies like wire, tape and cutters online when you order your flowers. Enlist your wedding party, friends and family and have fun with the creations! Click here for some great DIY tips on how to make your own flower garland. There are so many uses for flower garlands, it’s no wonder they are a hot trend for 2017! They add an element of beauty and nature to any area of the venue. 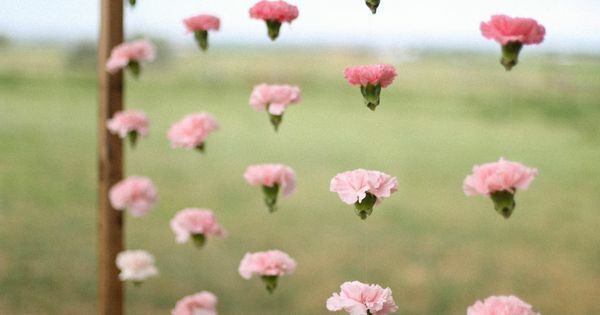 A garland can add that special extra touch to your event. We’ve collected a few of the most inspiring uses for flower garlands here, but don’t be afraid to get creative! Add a special touch to any signs at your venue, with the addition of beautiful fresh flowers. 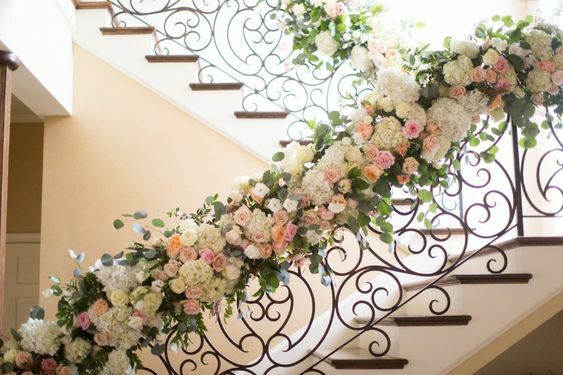 If your venue has a staircase, a fresh flower garland transforms it from ordinary to magical! 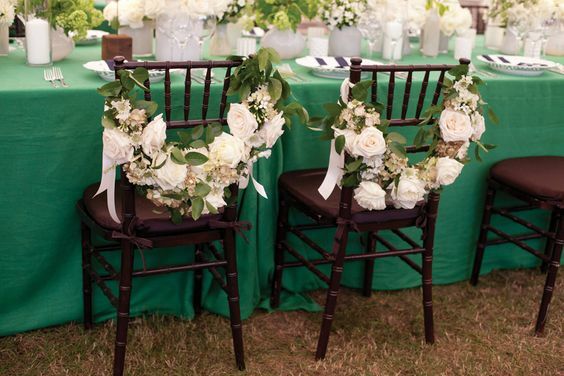 Help designate places of special honor by draping lovely floral garlands on the chairs. Add a very special touch to the head table, guest book table or anywhere you want to add some “wow” factor. 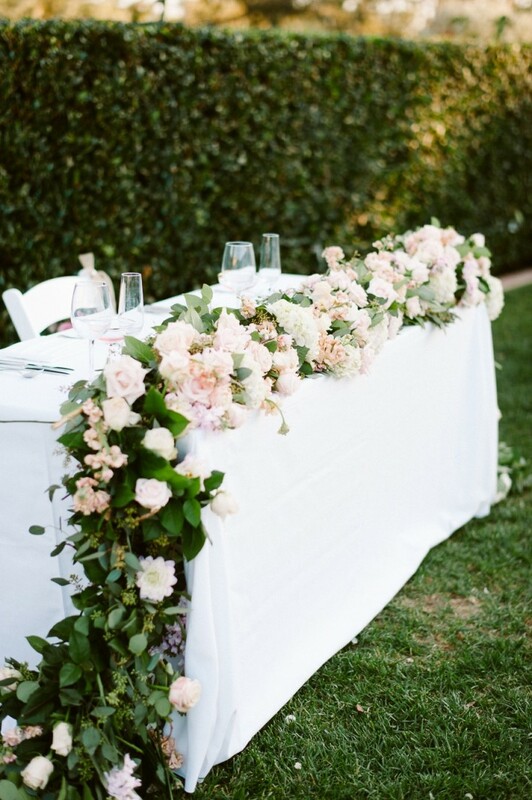 Draping a beautiful floral garland is the prefect complement to this outdoor venue and the crisp white linens. Use flower garlands, elaborate or simple, to frame a special location or add a vibrant and unique backdrop. Bouquets and rose petals are always a gorgeous choice for your flowergirls, but a lovely flower garland can be a fresh new option as well! If you love all things stylish, chic and ultra modern, then we have some fantastic centerpiece suggestions for your wedding or event! We’ve searched around to find some wonderful and inspiring ideas to prove that centerpieces don’t have to be traditional. These photos show a modern take on flower choices, presentation and container selection. Flowers like these are sure to get your guests talking, in the very best of ways! Photo left: Use clear vases of varied sizes or heights. Presenting them in a long row with some candles to up-light them will have a more dramatic impact. Submerging some of the blooms underwater will also create impact. Use large blooms in stylish pops of color, in alternating presentation. 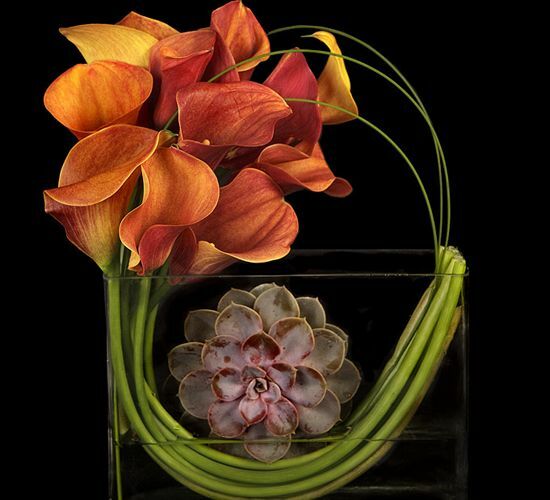 Shown here: orange tulips, white cymbidium orchids, and orange calla lilies are all very modern flower choices due to their larger petals and vivid colors. All are available (in season) at low bulk prices through BunchesDirect! An easy DIY take on a very stylish look! Flower pots get a new lease on life when painted white. Use white twigs to hold up foam balls you can find at the local craft store. Cover the foam by gluing or pinning carnation blooms to cover. The hot pink is an excellent choice to keep things current and vibrant. Presto: modern magic! Carnations sold in bulk at BunchesDirect. Vary the shape and choice of your container, and don’t be afraid to get creative! This square box in a vibrant green is the perfect modern setting for this clever arrangement of blooms. Shown here: carnations (always a budget-friendly and beautiful choice) are placed in an artful array of color blocking. The complementary colors provide good contrast and a fresh take on a centerpiece display. Massing one type and color of bloom creates modern impact, especially when the stalks are left deliberately long to stand up high in the glass container. 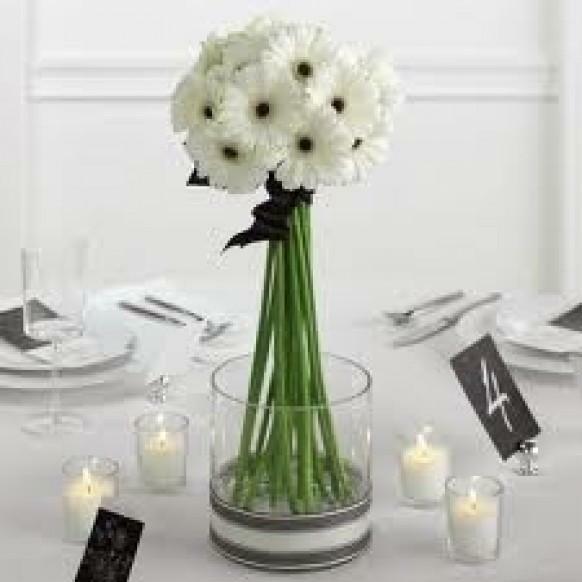 Shown here, the white gerbera daisies are a sturdy and stylish choice. Mix fruit and flowers in low boxes for a chic twist on dinner centerpieces! This would be especially lovely at an autumn event. Try red roses, hypernicum berries, or orange mini calla lilies, along with apples, seeds, or pomegranates for a very modern mix. Calla lilies are always a good choice for a more contemporary look due to their large, sculptural blooms, clean lines and long, vibrant stems. Drape a bunch artfully in a square container or a low bowl in clear glass, and add a creative accent. Simple, clean and so elegant! Use clear cubes of varied heights and square votive candles to create a modern cluster. Use white roses and inset the flowers slightly for a more contemporary presentation. Who doesn’t love a good romance movie, especially ones that feature a beautiful wedding? Whether the wedding is funny or moving, some of our best sources of inspiration for wedding flowers can come from our favorite Hollywood flicks. Movies spend big bucks on set and costume designs and provide us with some magical results. The rest of us, however, don’t have to spend big while still enjoying these wedding flower looks. We’ve pulled together some iconic movie wedding bouquets, and paired them with our own BunchesDirect selections! Which one is your favorite? Ah, yes, Bride Wars saw Kate Hudson play Olivia, who ends up going off the rails in attempts to sabotage her best friend’s wedding and secure the coveted Plaza Hotel as a wedding venue. Another bride from the same movie! Anne Hathaway played sweet teacher Emma, who also ended up vying for a dream wedding on the same day as her best friend Liv. Who could possibly forget the STUNNING array of flowers in the forest wedding of Bella and Edward? Kristen looked amazing in this vintage-inspired gown, and the abundance of flowers hanging from the trees and twined into the magnificent wedding arch was truly breathtaking. In this movie, perennial bridesmaid Jane always puts the needs of others before herself, even to the point of allowing her sister to marry the man Jane thinks she is in love with. But, Jane gets her happy ending with Kevin, the reporter she met while he was doing a secret story on her life of repeat bridesmaid gigs (you’d have to see the movie to really get it all). While some of the bridesmaid dresses are shall we say, questionable, we loved this gorgeous yellow and white bouquet featuring roses, peonies and ranunculus. BunchesDirect bouquet picks: Morning Surprise, or Together We Stand (see below) with yellow roses added. Reese played New York fashion designer Melanie, who gets engaged to the city’s most eligible bachelor (played by our own Dr. McDreamy Patrick Dempsey). Her heart, however, still belongs to childhood sweetheart Jake. Melanie may have bailed on this wedding (am I sensing a theme here?) but she looked sleek and stylish while doing it. We picked this movie bouquet as a fave because it is a true classic, and shows that you can never go wrong with white flowers. BunchesDirect bouquet pick: Fancy White . In this Abba-loving, Meryl-Streep-starring, light-hearted movie, Amanda shone as the sweet and bubbly Sophie. Sophie is set to marry her true love, and decides to use to wedding invitations to try and track down her biological father. We loved this flowing, non-traditional gown and the hillside wedding venue (remember all the candles up the endless stairs?). If you love this free-spirited look, opt for a bouquet that is less structured and includes a mix of pretty blooms. BunchesDirect bouquet picks: Puppy Love, or Snow White (below). Mindy Weiss is one of the world’s top wedding and event planners! Based out of Beverly Hills, California. Mindy and her team are praised for boundless creativity, innovation and attention to every last detail. Their passion for top notch event planning have made her a much-sought-after fixture on the celebrity party circuit. Mindy and her team have planned special events for celebrities such as Fergie & Josh Duhamel, Ellen Degeneres & Portia Rossi, Jessica Simpson, Lala and Carmelo Anthony, Serena Williams, Nicole Richie and Joel Madden, Heidi Klum, Pink, Gwen Stefani & Gavin Rossdale, Kimberly Williams & Brad Paisley, Channing Tatum and Jenna Dewan. If you are a fan of the TV series “The Bachelor,” Trista & Ryan’s, J.P. and Ashley’s, and Sean and Catherine’s weddings were all featured on ABC. For those of us who don’t have the budget to simply hire Mindy Weiss Designs to plan our wedding or event, we can still turn to her books, website and television events for some fabulous inspiration. Check out these awesome tips when planning your own wedding or event decorations. 1. Use bouquets as a floral display or centerpiece at the reception. At the Four Seasons in Los Angeles, Mindy used simple bridal bouquets and artfully displayed them in glass vases of various shapes. Keep your flowers all one color and the vases clear to make this display work despite the different flower types and vase shapes. White lisianthus, hydrangeas, orchids or mini calla lilies would all provide the elegant impact. All these blooms are available in bulk at BunchesDirect so you can make your own bouquet arrangement just like Mindy’s. We also provide you with ready-made bouquets for added stress relief. Try Classic White Hydrangea bouquets, for example, and you are ready to go! 2. Centerpieces don’t have to be elaborate to have a lot of “wow” factor. These gorgeous centerpieces were also made for the Four Seasons LA, out of artfully arranged calla lilies and beautiful white roses twined over a glass candelabra. Simple, but so stylish! 3. Attach bouquets of flowers to each pew with beautiful fabric bows for an gorgeous decorative touch at the ceremony, as Mindy did at the Four Seasons Biltmore. Tulips are shown here, available in season and in bulk at BunchesDirect, but other favorite flowers would be dazzling also. If you want to keep things elegant, stick to one color and one type of bloom for more impact. 4. Embellish accents like this small section of fencing at an outdoor wedding, using fresh greens and flowers. Blooms such as white or cream roses, godetias, lisianthus, peonies, green hydrangeas, and greens such as eucalyptus or palm fronds would all make amazing floral accents. Buy in bulk and attach with floral wire! Hang vintage lanterns for an even more romantic effect. 5. Buy bulk roses in pastel shades like cream, pink and lavender for a simple but beautiful way to embellish the seating card table, as Mindy’s team did at the Hotel Bel Air. 6. Don’t overlook the details! Even small touches can have big impact on your guest experience. Buy bulk flowers such as roses or red ranunculus and add a simple, perfect bloom alongside the menus at your guest place settings.